Xiaomi has dropped its Mi VR Play headset but it's not the Daydream device we were expecting. Over one million people signed up to become a beta tester this week and from this number, tens of thousands will be selected to pay RMB 1 (just $0.15) to get a Mi VR Play. The headset is made from lycra to make it light and comfortable, fits 4-inch to 5.7-inch smartphones and features a two-way zipper to ensure it can handle your handset. There's anti-reflective aspheric lenses and a textured metal button on the top of the device. 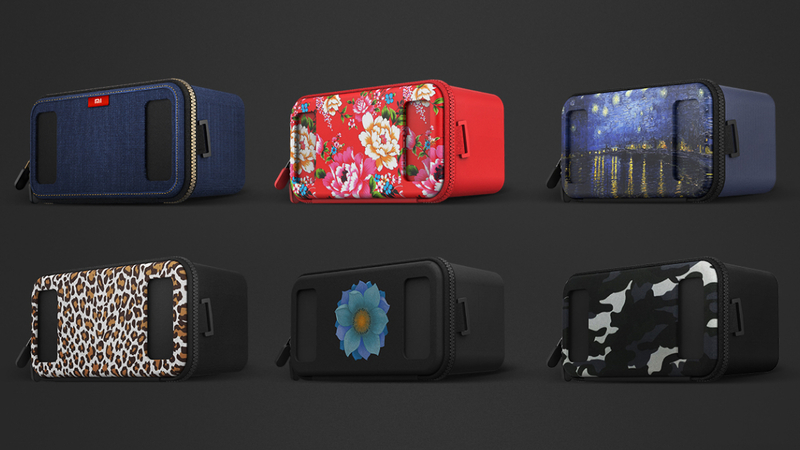 Customisation is also high up on Xiaomi's priorities - no surprise given it's a Chinese brand - so the Mi VR Play will be available in denim, pink, floral, leopard, camouflage, lotus and night sky styles. As for what you'll view on the headset, there will be VR videos, experiences and games from partners including Youku - China's YouTube equivalent - Conde Nast Traveler, VR Hotcast and more. Mi VR is described as an "open VR platform for China". After the beta testing has finished, the headset will be more widely available. There's no word on price or release date for this final model yet though we're hoping (and assuming) Xiaomi will keep the price below the current line of Cardboard viewers. Xiaomi's general manager said in an earlier post on Weibo that Xiaomi's own headset will help to optimise the VR experience for MI UI users. This autumn we're expecting VR headsets for Google's new mobile VR platform from Samsung, HTC, LG, Sony, Huawei and Asus. Now, Daydream headsets will only work with Daydream-ready phones running Android N with a VR mode for high performance. Xiaomi is still planning to release Daydream-ready smartphones later this year despite this new VR tactic. One reason Xiaomi may have chosen to develop its own Mi VR app is the snag that Google's services are restricted in China. That includes things like the Play Store, YouTube and Street View, which will have dedicated VR apps. So we're interested to see what Google does with this. In the world of smartwatches, Google has got around these issues with the help of China-focused services from Mobvoi. VRHow do you make money from VR?